Resurrection is most commonly associated with the reuniting of the spirit and body of a person in that person's afterlife, or simply with the raising of a person from death back to life. What this means depends upon one's presuppositions about the nature of the human person, especially with regard to the existence of a soul or spirit counterpart to the physical body. The term can be found in the monotheistic religions of Judaism, Christianity, and Islam, when they happily depict the final blessing of the faithful that are resurrected in the grace of God. It does play a particularly powerful role in Christianity, as the resurrection of Jesus is its core foundation. At the same time, these religions unavoidably talk also about the unfaithful resurrected for eternal curse. What the nature of the resurrected body is may still be an issue. But, if the resurrection of the body is considered to restore some kind of psychosomatic unity of a human personality, it carries profoundly important implications. Recent philosophers of religion insightfully try to connect this restored psychosomatic unity with the continuation of a personal identity beyond death. Furthermore, this resurrection discussion seems to be increasingly exploring the possibility of spiritual growth and eventual salvation through the restored psychosomatic unity beyond death. For this purpose, some Christian thinkers make a controversial use of the notion of reincarnation from Eastern religions and ancient Greek philosophy as an alternative for resurrection, and others try to develop a new Christian position to say that bodily resurrection, and not reincarnation, can make personal spiritual growth after death possible. Ezekiel’s vision of the valley of dry bones being restored as a living army: a metaphorical prophecy that the house of Israel would one day be gathered from the nations, out of exile, to live in the land of Israel once more. 1 Samuel 2:6, NIV—"he brings down to the grave and raises up." Job 19:26, NIV—"after my skin has been destroyed, yet in my flesh I will see God." Isaiah 26:19, NIV—"your dead will live; their bodies will rise." Ezekiel 37:12, NIV—"I am going to open your graves and bring you up from them." Other passages may be more ambiguous: In the Hebrew Bible, Elijah raises a young boy from death (1 Kings 17-23), and Elisha duplicates the feat (2 Kings 4:34-35). There are a multiplicity of views on the scopes of these acts, including the traditional view that they represented genuine miracles and critical views that they represented resuscitations, rather than bona fide resurrections. Other common associations are the biblical accounts of the antediluvian Enoch and the prophet Elijah being ushered into the presence of God without experiencing death. These, however, are more in the way of ascensions, bodily disappearances, translations, or apotheoses than resurrections. The idea of resurrection was developed in Judaism during the Maccabean struggle. In face of death in the unbearable persecution, Jewish people desperately hoped for their resurrection as a reward for their faith: "The King of the world will raise us up, who die for his laws, in the resurrection of eternal life" (2 Maccabees 7:9). Hence, Daniel's vision, where a mysterious angelic figure tells Daniel: "Multitudes who sleep in the dust of the earth will awake: Some to everlasting life, others to shame and everlasting contempt" (Daniel 12:2, NIV). The notion of resurrection became widespread in Judaism especially among the Pharisees (but not among the Sadducees) by the first century C.E. C.F. Evans reports, "The surviving literature of the inter-testamental period shows the emergence of resurrection belief in diverse forms: Resurrection of righteous Israelites only, of righteous and unrighteous Israelites, of all men to judgment; to earth, to a transformed earth, to paradise; in a body, in a transformed body, without body." A famous Medieval, Jewish halakhic, legal authority, Maimonides, set down thirteen main principles of the Jewish faith according to Orthodox Judaism, and belief in the revival of the dead was the thirteenth. Resurrection has been printed in all Rabbinic prayer books to the present time. The Talmud makes it one of the few required Jewish beliefs, going so far as to say that "All Israel have a share in the World to Come…but a person who does not believe in…the resurrection of the dead…has no share in the World to Come" (Sanhedrin 50a). The second blessing of the Amidah, the central thrice-daily Jewish prayer is called Tehiyyat ha-Metim ("the resurrection of the dead") and closes with the words m'chayei hameitim ("who gives life to the dead"), that is, resurrection. The Amidah is traditionally attributed to the Great Assembly of Ezra; its text was finalized in approximately its present form around the first century C.E. Christianity started as a religious movement within first century Judaism, and it retained the first-century Jewish belief in resurrection. Resurrection in Christianity refers to the resurrection of Jesus Christ, the resurrection of the dead on the Judgment Day, or other instances of miraculous resurrection. Jesus was resurrected three days after his death. A unique point about his resurrection was that it took place very soon, without waiting till the last days, although the first century Jewish belief was that resurrection would take place sometime in the future, when the end of the world would come. The resurrection of Jesus may have been the most central doctrinal position in Christianity taught to a Gentile audience. The Apostle Paul said that, "if Christ has not been raised, your faith is futile" (1 Corinthians 15:17, NIV). According to Paul, the entire Christian faith hinges upon the centrality of the resurrection of Jesus. Christians annually celebrate the resurrection of Jesus at Easter time. Most Christians believe that there will be a general resurrection of the dead at the end of the world, as prophesied by Paul when he said that "he has set a day when he will judge the world with justice" (Acts 17:31, NIV), and that "there will be a resurrection of both the righteous and the wicked" (Acts 24:15, NIV). 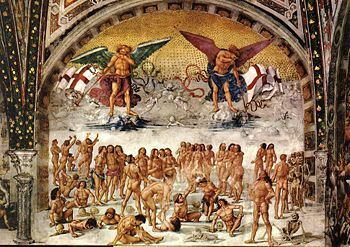 The Book of Revelation also makes many references to the Day of Judgment when the dead will be raised up. Most Christians believe that if at their death the righteous and the wicked will immediately go to heaven and hell, respectively, through their resurrection the blessing of the righteous and the curse of the wicked will be intensified. A more positive side of the Christian teaching related to the resurrection of the dead, however, is that the intensified blessing of the righteous is made possible only through the atoning work of the resurrected Christ. Belief in the resurrection of the dead, and Jesus Christ's role as judge of the dead, is codified in the Apostles' Creed, which is the fundamental creed of Christian baptismal faith. The resurrected Jesus Christ commissioned his followers to, among other things, raise the dead. Throughout Christian history up to the present day, there have been various accounts of Christians raising people from the dead. In the New Testament, Jesus is said to have raised several persons from death, including the daughter of Jairus shortly after death, a young man in the midst of his own funeral procession, and Lazarus, who had been buried for four days. According to the Gospel of Matthew, after Jesus' resurrection, many of the dead saints came out of their tombs and entered Jerusalem, where they appeared to many. Similar resuscitations are credited to Christian apostles and saints. Peter raised a woman named Dorcas (called Tabitha), and Paul restored a man named Eutychus, who had fallen asleep and fell from a window to his death, according to the Book of Acts. Following the apostolic era, many saints were known to resurrect the dead, as recorded in Orthodox Christian hagiographies. Faith healer William M. Branham and evangelical missionary David L. Hogan in the twentieth century claimed to have raised the dead. A fundamental tenet of Islam is belief in the day of the resurrection (Qiyamah). Bodily resurrection is heavily insisted upon in the Qur'an, which challenges the Pre-Islamic Arabian concept of death. Resurrection is followed by judgment of all souls. The trials and tribulations of the resurrection are explained in both the Qur'an and the Hadith, as well as in the commentaries of Islamic scholars such as al-Ghazali, Ibn Kathir, and Muhammad al-Bukhari. Muslims believe that God will hold every human, Muslim and non-Muslim, accountable for his or her deeds at a preordained time unknown to humans. The archangel Israfil will sound a horn sending out a "blast of truth." Traditions say Muhammad will be the first to be brought back to life. According to the Qur'an, sins that can consign someone to hell include lying, dishonesty, corruption, ignoring God or God's revelations, denying the resurrection, refusing to feed the poor, indulgence in opulence and ostentation, the economic exploitation of others, and social oppression. The punishments in hell includes adhab (a painful punishment of torment) and khizy (shame or disgrace). The punishments in the Qur'an are contrasted not with release but with mercy. Islam views paradise as a place of joy and bliss. Islamic descriptions of paradise are described as physical pleasures, sometimes interpreted literally, sometimes allegorically. There are a few theological issues related to resurrection more sharply identified and more explicitly discussed in Christianity than in Judaism and Islam. First of all, what is the real meaning of the resurrection of the body? Is it the precise resuscitation of the same physical body as before? Yes, it is, if it concerns above-mentioned resurrection miracles in Christianity (as well as in Judaism) in which the same physical body is still there without decaying. But, what if the body decays and its elements disperse long after its death? In this case, only some Christians believe that still the very same earthly body will come back. Most Christians reject it in favor of Paul's assertion that bodily resurrection means to assume an "imperishable," "glorified," "spiritual body" (1 Corinthians 15:42-44), similar to Jesus in his resurrected state. It is "a body of a new order, the perfect instrument of the spirit, raised above the limitations of the earthly body, with which it will be identical only in the sense that it will be the recognizable organism of the same personality." Second, when does bodily resurrection happen? Paul has two different answers. His first answer is that it takes place immediately after physical death (2 Corinthians 5:1-4). His second answer is that it will take place on the Day of Judgment in the last days (1 Corinthians 15:51-52; 1 Thessalonians 4:16-17). Usually, Christianity (as well as Judaism and Islam) supports the second answer. But, if the resurrection of Jesus took place almost immediately after his death, it stands to reason that human resurrection may also take place immediately after physical death, following Paul's first answer. Also, if Paul's second answer were correct, there would be a long period of time from the moment of physical death until the last days, during which the soul would have to await its bodily resurrection—a period which is called the "intermediate state," or the state of "soul-sleep," in Christian theology. In this state, the soul would have no physical counterpart coupled with it, and it would make a personal identity impossible. This can become quite a strong reason to argue that bodily resurrection should take place immediately after death and not in the last days. A third issue is the continuation of a personal identity beyond death. As was noted above, one benefit of resurrection is "the recognizable organism of the same personality." In the words of Alan Richardson, "The idea of 'the resurrection of the body'…was the natural Hebraic manner of speaking about the risen life of Christians with Christ: It is in the body that persons are recognizable as individuals with their own personal identity. Hence, 'resurrection of the body' means resurrection after death to a fully personal life with Christ in God." The notion of a personal identity made possible by bodily resurrection is in agreement with the basic philosophical tenet of Thomas Aquinas that the individuation of "form" is made possible by "matter" that is coupled with "form." Just like there would be no individuation without matter, there also would be no personal identity without resurrection. The question is: Did God arrange humanity in the created world, so people might always enjoy personal identity? Or would God allow personal identity to be interrupted at times? If God created people as unique creatures in this world, it seems that he would not allow their unique identity to be destroyed even for a moment. There is still another important resurrection-related issue which the Abrahamic religions seem to have a considerable difficulty in addressing. It is about personal spiritual growth and salvation after physical death. Although the Bible suggests that Jesus, while in the tomb for three days, descended to Hades to preach to the "spirits in prison" there for their possible salvation (1 Peter 3:18-20), nevertheless most Christian Churches teach that once one dies, he will not be able to spiritually grow for salvation any more. At physical death, the righteous will immediately go to heaven and the wicked to hell. In the last days when they have bodily resurrection, their respective blessing and curse will be made more intense. The only exceptions are "purgatory" and "limbus patrum" ("limbo of the fathers"), as understood in the Catholic Church. Purgatory is understood to be a place of cleansing for those who do not go to heaven nor to hell due to their venial sins, and the "limbus patrum" is a place of Hebrew forefathers such as Jacob and Moses until the coming of Christ, at which they are finally allowed to participate in Christian salvation (Hebrews 11:39-40). Thus, conventional Christianity has no room for the spiritual growth and eventual salvation of the wicked, once they die. Even their bodily resurrection does not help; it only intensifies their curse. Some say that this can hardly justify the love of God. If, as was noted previously, a continued personal identity is one benefit of resurrection, can't personal growth toward possible salvation be another benefit of resurrection? Religions such as Hinduism and Buddhism can answer this question in the affirmative because their teachings of reincarnation as an alternative for resurrection can secure the personal growth of the soul through repeated life on the earth. In an effort to justify the love of God, therefore, some recent Christian thinkers adopted reincarnation to Christian theology. Whether reincarnation actually happens or not is a much debated question, especially among Christians. But, these days the possibility of an imperfect person's spiritual growth beyond death being brought forth through resurrection (and not through reincarnation) is increasingly voiced even by Christian thinkers. If bodily resurrection brings back an imperfect person's psychosomatic status even after death, it enables that imperfect person to somehow relate to, and receive a merit from, a righteous earthly person because that earthly person naturally has a similar psychosomatic unity already. This can be how the imperfect person, and even the wicked, can still grow for possible salvation even beyond death. The Bible seems to support this, when it talks about the bodily resurrection of the imperfect Old Testament saints (Matthew 27:52-53) and their salvation through earthly believers in Christ: "These were all commended for their faith, yet none of them received what had been promised. God had planned something better for us so that only together with us would they be made perfect" (Hebrews 11:39-40, NIV). Hopefully the salvation of the wicked who passed away may also be possible in the same way, however odd it may sound. ↑ St. Talka, The Second Book of the Maccabees. Retrieved June 25, 2007. ↑ Alan Richardson and John Bowden, "Resurrection," in The Westminster Dictionary of Christian Theology (Philadelphia: Westminster Press, 1983). ↑ Knoxville Revival, Revival Article: Resurrections of the Dead and the Revival. Retrieved June 21, 2007. ↑ Cyril Glasse, ed., "Resurrection," in The New Encyclopedia of Islam: Revised Edition of the Concise Encyclopedia of Islam (Walnut Creek, CA: AltaMira Press, 2001). ↑ F.L. Cross and E.A. Livingstone, "Resurrection of the Dead," in The Oxford Dictionary of the Christian Church (Oxford: Oxford University Press, 1977). ↑ Alan Richardson, ed., "Resurrection of the Body," in A Dictionary of Christina Theology (Philadelphia: Westminster Press, 1969). ↑ Geddes MacGregor, Reincarnation as a Christian Hope (New York: Barnes & Noble, 1982). ↑ John Hick, "Life after Death," in The Westminster Dictionary of Christian Theology (Philadelphia: Westminster Press, 1983). McCabe, Joseph. The Myth of the Resurrection. Retrieved June 21, 2007. Richardson, Alan, ed. A Dictionary of Christina Theology Philadelphia: Westminster Press, 1969. Zakydalsky, Taras. "N. F. Fyodorov's Philosophy of Physical Resurrection." Ph.D. diss., Bryn Mawr College, 1976. General Resurrection, The Catholic Encyclopedia. Resurrection of the Body, Catholic Answers Forums. Reincarnation: Its Meaning and Consequences. The Resurrection of the Body and Why It Matters, Worldwide Church of God. The Resurrection of the Body, Philosophy of Religion Online Textbook. This page was last modified on 9 July 2015, at 17:24.